The entrance to your home is the first impression visitors get when they visit. 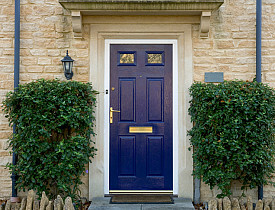 Does your front entrance let people know anything about you and your taste? Whether you live in a cottage or a larger home, here are some tips for creating a welcome and attractive entrance. 1. Paint the front door. This is on my to-do list for the next month. I will be calling my local Atlanta painting contractor, since applying a fresh coat of paint to your front door goes a long way to giving an entrance an inexpensive facelift. The color you select should complement the paint colors or materials your home is constructed of and any containers located near the door. 2. Add a few large decorative pots of plants on either side of the front door. You can also add some interest by having just one container that is a focal point, such as a bonsai, which will offer a different look in every season. Using two oversized pots with hardy evergreens (conifers or broadleaf types) will soften the look of the hardscape, and by using large pots you won’t have to worry about watering so much. Remember there are many shades of green, you can mix and match or use just one type of plant. Make sure the containers you use have drainage holes and are weather proof. 3. Add seasonal color to existing container plantings. For example, in the autumn you can add winter blooming annuals like violas and in the spring you can replace these with annuals like Caladiums and ferns, for long season color in the shade. For a dramatic statement in the full sun, use succulents like Agave which add a sculptural element or big leaved plants such as Elephant Ears. 4. Cover unsightly walls or fences with evergreen vines. I have a large front stoop with an exposed concrete wall. I planted creeping fig, Ficus pumila at the base of the wall and after just a few years it is covered with tiny evergreen foliage that looks like wallpaper. Depending on what part of the country you live in, you could use a variety of different plants to achieve the same effect. 5. Add a window box or boxes to the front of your house. Make sure they are substantial and built to last with exposure to weather. Custom-made boxes may be your best option. By building your own or having someone make them for you, they are bound to last and, you can choose materials that will suit the style and architecture of your home. Add colorful branches to the window box in winter for more color. 6. Add a small water feature at the entrance to your home. There are myriad possibilities, from small wall mounted types to a simple container filled with water and decorative stones. 7. Make sure that the route to your front door is obvious and the path is comfortable and easy to walk on. Adding ornamental grasses or grass-type plants like Carex ‘Evergold’ at various points along the path will soften the overall look. Erica Glasener writes for Networx.com. I Want to Put An Addition on My House. Now What?